Wouldn’t it be amazing if your space was designed with your needs in mind? Very rarely do you find a home that truly speaks to our needs right off the bat. The good news is, Rinehart Design Group makes it possible for you to add custom cabinetry throughout your house that truly is designed with only you and your needs in mind. Not sure it’s worth the cost? 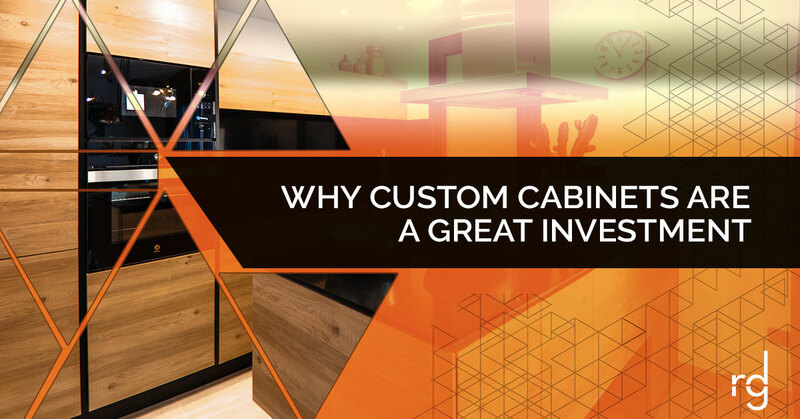 Well, keep reading and see a few of the reasons that investing in custom cabinets for your home is one of the best choices that you can make. Quality is something that we all want to see in our homes. Unfortunately, it’s not always what we get. More often than not the cabinets that we have in our home are made from a cheap laminate or wood that you had no choice in. They’re also not designed to provide you with the optimum amount of storage. Essentially, what you see is what you get. When you invest in custom cabinetry, you know that you’re going to be receiving high-quality cabinetry, made from high-quality materials. Aside from that, a talented individual is the one that’s going to be crafting them — a professional! With their knowledge and their skills, you get custom cabinets that are made well and take your storage needs into consideration. If you’re wanting a unique design in your kitchen, one of the best things that you can do is choose to use custom cabinetry. Not only will custom cabinets provide you the freedom to select a cabinet design that works with your storage needs, but there’s much more freedom in terms of the designs that you’re able to select. Being able to mix and match the pieces of your cabinets and the designs that are utilized for each cabinet unlocks endless design options. If you’re looking for a little more control in regards to the design of your kitchen, custom cabinets are exactly what you’re looking for. Kitchens often have odd layouts that can make it a pain to really make the most of the space that you have. Even with awkward bends or dips in your kitchen, custom cabinets are a solution! Since these cabinets are built to order, they’re built to fit the layout of your kitchen — regardless of how weird it may be. If you’ve been struggling to really make the most of the kitchen space that your home has to offer, choosing to invest in high-quality, custom-made cabinets could be the game changer that you’ve been needing. This can make all the difference in how open a space is, how easy it is to work in the kitchen, and how much storage you have. Don’t think that you’re stuck with whatever layout you have now — invest in a better one! Now that we’ve talked a little bit about how awkward kitchen layouts can be, let’s talk about the space that you’re currently wasting in your kitchen. When you think about the cabinets that you currently have in your kitchen, are there any that are going unused? More often than not, there are at least a couple of cabinets that don’t get touched, and that’s a waste of space. More importantly, how many of your cabinets actually give you the storage space that you need to make the most of it? It’s very rare for us to hear that the standard cabinets that come with a house are making the most of the space in the kitchen. Rather than let the current layout waste the space that you’ve been given, choosing to add custom cabinets to your kitchen can really optimize the space within your kitchen. From the way that the cabinets are designed to the way that they’re laid out in the kitchen, we work to ensure that the space that we are working in is used efficiently and suits your needs. We’ve talked about the awkward layout of your kitchen and how much wasted space happens when you have cabinets that aren’t designed for your needs, but now we’re going to talk about how nice it is to have a place for all of your things. If you don’t currently have custom cabinets, then the concept of having a space designed to organize and hold everything that you have in your kitchen sounds ridiculous, but it could be a reality! Cabinets have come a long way in the last couple of years. From designs that make it easy to store and access pots and pans to cabinets that make it easy to store a trash can or larger appliances, you can customize your kitchen so that you have the storage you need. As you go about looking at which cabinets you’d like to have in your kitchen, you can take into consideration what types of storage needs you’re lacking now. The chances of there being a cabinet designed specifically for that item or purpose are relatively high. Interested in learning more about custom cabinetry and how you can get started? Reach out to Rinehart Design Group! We’ve been fortunate enough to provide homes across the United States with custom cabinets that they’re happy to add to their home. Reach out to us today, and we can help you dream up the ideal storage for your space.